Tis the Christmas Season: a time for memories that stir our senses: cookies baking in the oven, houses sparkling with Christmas lights, and bells jingling at local grocery stores. It is also a time to remember how we have been blessed at our chronologically advantaged age. But sometimes it is hard with all the bad news: shootings near and far, physical challenges we endure; and the personal losses that touch us - particularly at this time of the year when we would give everything to again share memories of Christmas’s pasts with friends and loved ones who are no longer with us. But I would also suggest two more steps. Fourth, each day give at least one person a big hug - the human touch is an essential nutritional requirement for the spirit. And last, if there has been something you have been meaning to tell someone, tell them. Don’t wait. There are reasons as we get older why we don’t buy green bananas. Whether your glasses are rose colored, broken or you can’t find them, during this season of hope, love and possibility, consider these five steps to better see all that is good and right - and the bountiful banquet that is spread before us. This is usually the place where I announce the performers for Tuesday Night music, but because of the holidays, we have pushed the pause button until January 8th. But the sounds of guitars strumming and cowgirls singing won’t totally vanish. Every Wednesday before and after the Meals-on-Wheels noon dinner, there is music for your listening pleasure – and there are often several couples who take the opportunity to stretch their legs and dance a few steps. Annie Lane and “For the Good Times” alternate Wednesdays. And on the third Thursday, Tom Graff stops in and warms up the diner crowd. Particularly if you don’t like to get out after dark, this is your chance to enjoy listening and dancing to some good country tunes. This week’s ”Remember When” question is about the successful jazz vocalist and actress who became nationally known with the 1951 hit “Come on-a My House” written by the unusual duo of author William Saroyan and David Seville (who would later create the famous Alvin and the Chipmunks) and recorded with Mitch Miller and his orchestra. But during the Christmas season she is remembered for starring in the 1954 Christmas movie classic with Bing Crosby, Danny Kaye and Vera-Ellen. What was this singer/actress’s name? E-mail your answer to the mcseniorcenter@gmail.com, call 541-296-4788 or mail it with a package of "Extra value is what you get, when you buy Coro-net” paper towels. The Center and Meals-on-Wheels will be closed for Christmas Eve, Christmas as well as New Year’s Day. And since Christmas and New Year’s Day fall on Tuesdays - the day this column is printed, I won’t be back visiting with you until next year on the 8th. So until we meet again, I wish each and every one of you a very Merry Christmas and the best in the New Year. And as the famous anonymous once said, “As you slide down the banisters of life, may the splinters never point the wrong way”. Fortunately I kept that thought to myself and instead offered more sagely advice reflecting my years of wisdom and experience: “Stay socially connected and keep moving”. Good advice, right? But after several days of reflection, I should have answered “To age well you need to learn to accept and adapt”. As we age, we experience changes we never thought would happen to us – uncooperative bodies, memory lapses and personal losses. But it is important to accept “the way it is” - this new and often challenging reality. But accepting is not the same as “giving up” - if you identify ways to adapt. For instance, if it is getting difficult to drive, avoid complicated intersections; if you can’t read because of poor vision, listen to books on tape; and if you have lost close friends, meet new ones. Although we may wish we could just take off our shoes, kick back and relax at this stage of our lives, we know it isn’t that easy. But the good news is that with effort, creativity and perseverance, we can accept and adapt - and make the remaining years of our lives both purposeful and rewarding. 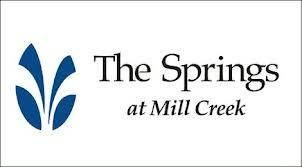 Hot cakes, scrambled eggs, and sausage or bacon is the menu for the Center’s Christmas Breakfast sponsored by the same folks as last year, but with a new name this year- “The Springs at Mill Creek”. They are bringing along Santa, gifts and holiday entertainment with “Harmony of the Gorge”. 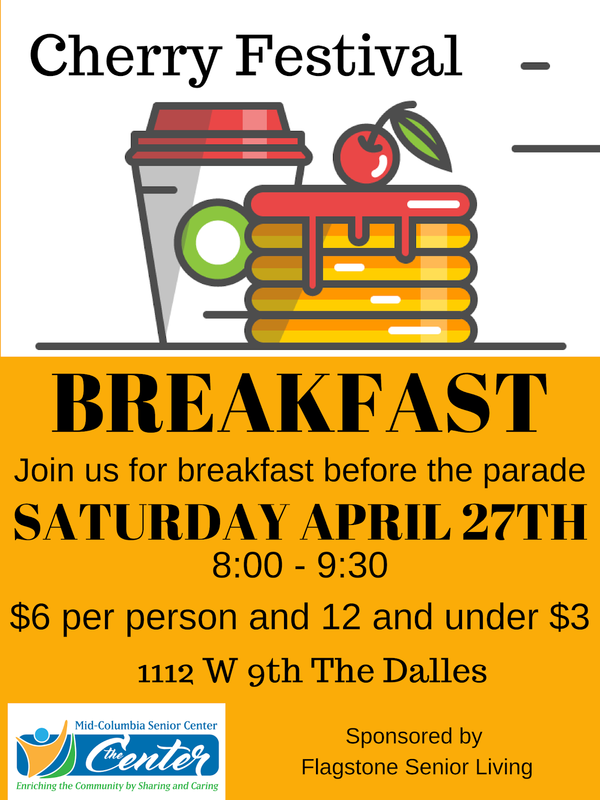 This is your chance to get into the holiday spirit and while enjoying a delicious Saturday breakfast. If you appreciate the art, cultural and historical non-profits, you only have three weeks to donate to your nonprofit of choice and to the Oregon Cultural Trust in order to receive a matching tax credit. All you have to do is make a donation to any of Oregon's arts, heritage and humanities non-profits including twenty-two in Wasco and Sherman County (listed at www.culturaltrust.org); make a matching gift to the Cultural Trust; and then claim your entire contribution to the Cultural Trust as a tax credit. The Oregon Cultural Trust is an innovative public-private fundraising and grant making program that funds the local Wasco Cultural Trust Coalition which annually distributes $500 to $1000 grants to area schools and non-profits. The Center’s Nu-2-U Shop is overflowing with used clothes of all kinds. So Betty and Martha are having their End-of-the-Year Bag Sale on Thursday and Friday (13th and 14th). And for both days the store will be open from 10:00 - 3:00 PM. Tonight at the Center, Martin and Friends will be playing the last Tuesday Night performance in 2012. But like bed bugs in a cheap hotel, the music will be back on January 8th starting at 7:00 PM. The 1948 - 1957 television show that used puppets to appeal to the children but was watched more by adults was “Kukla, Fran and Ollie”. (And the winner of a Christmas Breakfast is Herm Neuberger.) For this week’s “Remember When” question, I may be repeating myself since I can’t remember if I’ve asked this question before. (But then I imagine you can’t remember either!) So possibly for the second time, what comedy duo had their own show on both radio and television that included imaginary off the wall interviews with recurring characters such as Wally Ballou, Biff Burns, Arthur Sturdley, Webley Webster, and the McBeeBee twins. E-mail your answer to the mcseniorcenter@gmail.com, call 541-296-4788 or mail it with a tape of the radio soap opera “Mary Backstayge, Noble Wife”. Well, it has been another week, remembering the past while imagining the future. Until we meet again, celebrate the years remaining because, to paraphrase Robert Frost, the afternoon knows the joys what the morning never suspected. “Spring passes and one remembers one's innocence. Can you imagine an Intelligence Scanner you wear as a ring or necklace and helps you see and remember things; or an Auto Car that transports you to the store without you having to drive it; or a gloved sleeve you wear over your arm controlling involuntary arm movements so you can drink a cup of coffee without spilling it. These are just three of the twelve projects I had the fortune of judging last weekend at the FIRST (For Inspiration and Recognition of Science and Technology) LEGO League Robotics competition for the Gorge area. Through these regional competitions, teams of 9 - 14 year old students experience real-world science and technology by building a robot that performs specific tasks, but also creating a project that offers a solution to a challenge facing the nation. The challenge this year was “Senior Solutions” - finding solutions that help older adults stay independent, engaged and connected. In developing their project, each team selected a Senior Partner to learn more about the challenges facing older adults, and then imagined and researched a solution to a problem that was identified from the conversations with their Senior Partner. As part of the competition, each team’s solution was evaluated based on the level of research and innovation as well as the quality of their presentation. Several older adults from the Center were recruited to be Senior Partners for the four teams from Colonel Wright Elementary. Because of that connection with the Center, several of the Colonel Wright teams have agreed to present their projects at the Center for the 11:00 Tuesday Lecture on the 11th, It will be fun and you will have an opportunity to see budding scientist in the making. I just wish they would hurry up and build the memory enhancement device. I need it now! Several weeks ago when I wrote about the value of support groups I forgot to mention the Women Widows of Veterans Gathering and Support Group which meets every second Tuesday of the month (which according to my Gregorian calendar is December 11th) at 11:00 AM at the Veteran Services Office at 201 Federal Street in The Dalles. The gatherings are an opportunity for grief support as well as ensuring that widows of veterans are accessing all the support available from Veteran Services. 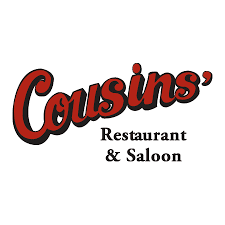 For more information, call Barb Thomas at 541-467-2651, Ruth Otto at 541-769-0078 or Joyce Powell Morin at 541-296-7266. One last reminder. This Wednesday, the 5th, the monthly iPad User’s group will meet at 1:00, as well as the first meeting of the Kindle User’s Group at 2:00. These user groups are for both beginners and experienced users (we need someone who knows what they are doing) and will give you a chance to share what we know and ask questions about what you don’t. Tonight at the Center, The Strawberry Mountain Band will be kicking up the dust. And next Tuesday on the 11th, Martin and Friends will be playing for your listening and dancing pleasure. The Center’s Tuesday Night Music will then take a break for the holiday season returning on January 8th. As always, the music starts at 7:00, everyone is welcome - including lonely reindeer waiting for the big trip, and donations are always appreciated. When I was on the Coffeebreak last month, Al Wynn mentioned this television show that used puppets and was totally ad-libbed. It first aired November 29th, 1948 on Chicago's WNBQ and was originally created for children but soon was watched more by adults. For this week’s “Remember When” question, what was the name of this television show? E-mail your answer to the mcseniorcenter@gmail.com, call 541-296-4788 or mail it with a 1961 picture of Buelah Witch, Fran Allison, and Madame Oglepuss. Well, it has been another week, appreciating life’s changes. Until we meet again, keep your eyes and mind open for new and exciting opportunities.